Our state (Israel) does not have the death penalty but our army drops cluster bombs on civilians. People are “eliminated” with no evidence and no trial. Our hands are “clean”, for it all gets done from the air. In the process we murder children, old people and ordinary passers-by. Only others have “blood on their hands”. Shulamit Aloni, the grand old lady of Israeli dissent, is a former Palmach fighter, a laureate of the Israel prize and a former leader of Meretz. She served as Education Minister in Yitzhak Rabin's government. Barenboim, close friend of the late Edward Said, accepted a Palestinian passport and has become a citizen of Palestine as well as Israel. Here is his take on the conflict: Israeli and Palestinian - Print Version - International Herald Tribune. Hat tip to All the Beirut News blog. From the Beirut Daily Star: Six finalists named for first 'Arabic Booker'. Six writers from Lebanon, Syria, Jordan and Egypt have been shortlisted for the first annual International Prize for Arabic Fiction, jury chief Samuel Shimon announced Tuesday during a news conference in London at the British Academy of Film and Television Arts. The jury, whose six members were also revealed for the first time on Tuesday, selected Lebanese novelists Jabbour Douaihy and May Menassa, Syrian novelist Khaled Khalifa, Jordanian novelist Elias Farkouh and Egyptian novelists Mekkaoui Said and Baha Taher from an entry pool of 131 writers from 18 countries. The shortlisted writers win $10,000 each, and are now in the running for the final $50,000 prize, which will be announced during an awards ceremony in Abu Dhabi on March 10. See more at The International Prize for Arabic Fiction. Another view on George Habash: ei: George Habash's contribution to the Palestinian struggle. Doesn't settle the question of violence, etc. The main point is, however, that Habash was honest, inspirational, modest, and willing to change his position. I think Westerners need to read this obituary carefully. I made this cake for my oldest son's birthday party on Sunday. 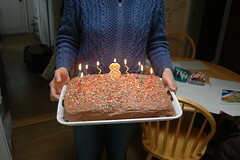 OK it was a box cake mix (two, in a giant pan) but the frosting was made from scratch with chocolate and butter. Yum. Just so the friends and family understand that I have good energy and I'm enjoying life. 25 people came to the party! A correspondent calling himself "George Assata" has been arguing passionately with me in the original George Habash thread. He seems very concerned that I be converted to a Marxist-Leninist analysis of world events. Assata said, quite touchingly: "you seem very much like a revolutionary to me. you want to change things, build a more free society, and all the while "enjoying this moment for its beauty." that's revolutionary! we just disagree on the means." We will probably continue to disagree on the means, but certainly he's making his argument more appealing than when he brought up the perfidies of counter-revolutionaries. i'm concerned that too many people are going to think that he was only about "violence." i think that's why i originally commented on your first post. it's important that people know how he and his comrades wanted to transform society for the betterment of humankind; how they upheld the equality of women; how they supported workers, trade unionists, peasants, the poor, oppressed nations, and all other exploited sectors of society; and how they fought against reaction, patriarchy, and elitist tendencies in their own ranks. that should be his legacy, and why we mourn his loss. I quote this because it is heartfelt. While it is not my opinion, I think it's one that deserves a hearing. My family in Lebanon is large and has many, many viewpoints on the Palestinians. One close relative who is more sympathetic to the cause than most of our tribe, who also reads this blog regularly, called me just now. This cousin feels I assigned responsibility to the PFLP and George Habash for the sack of our village and the death of our grandmother, and that this is a mistake. The PFLP was not involved in the tragedy of Mieh-Mieh 1985. The cousin says that he wishes that some one or group of the various Palestinian factions would have stopped these events - but they didn't. Still, he feels it's unfair for me to imply that the PFLP helped kill my grandmother. My original essay condemned all the revolutionary groups who used violence, and drew a connection between the armed resistance and the eventual destruction that happened to us in Mieh-Mieh. So in a broad way, I did accuse of Habash of responsibility. Direct responsibility? No, he was not directly responsible. I told my cousin that when you set a small campfire in the hills in the summertime, you cannot expect to control it. The wind and the dry fuel will blow the fire into a storm that will burn without mercy. On the question of Wadi' Haddad's responsibility for violent terrorist acts - my cousin just said that there were different, warring viewpoints inside the PFLP about committing those acts. He did not have the information and did not directly settle the question of whether George Habash was or was not responsible for attacking and killing civilians. He did insist that after the early 70s, George Habash called for one state in which Jews, Muslims and Christians would all live together as equals. My cousin says that Habash did not hate Jews as Jews. This cousin has also been reading The Lemon Tree and urges me to read it. Good idea.